This is a relatively free interpretation of the latest sketch at Sketch and Stash. I'm almost not sure I can enter it, but hey, I have no shame and will do it anyway. ;) I grabbed the BG and Kaiser Craft papers I had lying on my desk already and substituted a light green Bazzill cardstock for the pink I used on the last card. One of my new border punches (small and cheap) got a taste of paper for the first time! Oh I'm in love with border punches already. Must - have - more. The flower came from a packet of flowers I've had lying in a drawer for a while and not used... Just removed the cheezy plastic center and used a large shiny brad in stead. I've doodled a bit along the right edge, but it's hardly visible (neither in the photo nor IRL...!). 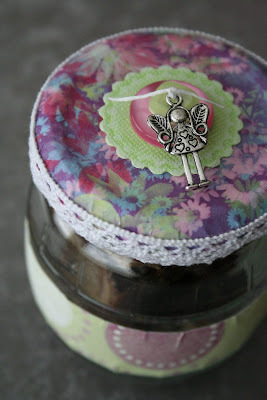 Used some scraps to decorate a glass jar I had lying around and filled it with as many home made Turtle Bars as I could, to make a quick and simple gift to go with the card. Beautiful card & gift! Love the colours & papers! Such a lovely card Eva, gorgeous colours and papers and I do like your take on the sketch too! So gorgeous Eva, I can see the sketch, it looks fab! !